Former T&T National Youth and Senior Team midfielder Jean-Luc Rochford could hardly put his relief into words yesterday after successfully undergoing surgery at the San Fernando General Hospital (SFGH). The procedure was intended to repair an ACL injury to his left knee that has had him sidelined for over 19 months. “I don’t know how to feel,” a drowsy but relieved Rochford told Wired868 soon after his surgery. “I’m happy, overjoyed! 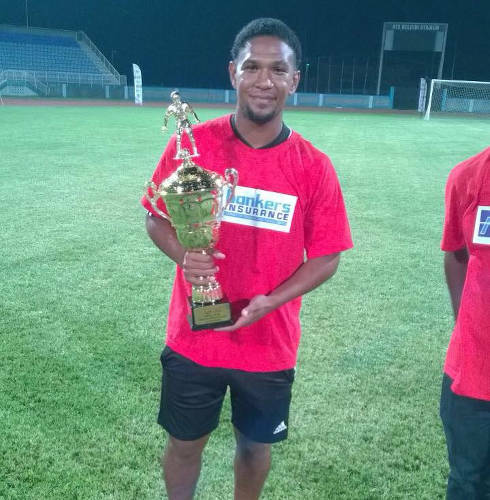 Photo: Two-time former Trinidad and Tobago World Youth Cup player Jean-Luc Rochford poses with the 2014/15 Pro League trophy while at Central FC. While bidding to earn a contract with Pro League outfit North East Stars for the 2016/17 season, the Arima native picked up the career-threatening injury which put his life on hold for almost two years. During a pre-season training session on 12 August 2016, Rochford stepped in a hole at the Larry Gomes Stadium training field and twisted his knee. 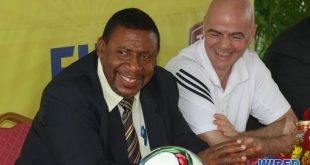 Rochford had earlier confided to Wired868 that “This is the worst thing to ever happen to me.” He was referring largely to the fact that the organisations to whom he had turned for help—from North East Stars to the TTFA to the Ministry of Sport—had all failed to provide the support he felt he should have got during his lengthy ordeal. Having served his country with distinction in the junior ranks and at two Youth World Cups, the 27-year-old believed that he would readily be granted at least a letter of recommendation to have priority surgery at a public health facility. His pleas, however, fell on deaf ears. But, despite the long wait, help finally arrived. 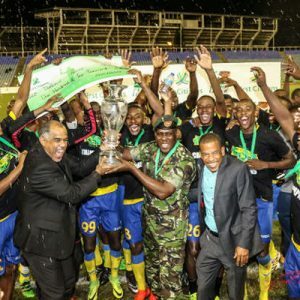 One month ago, an intervention by former national senior team doctor Dr Terrence Babwah put Rochford in touch with personnel at the SFGH. Confirming, prior to Wednesday’s surgery that the SFGH was “pushing through,” an eager Rochford refused to get ahead of himself. In August 2017, after interventions by other distinguished sports doctors, Rochford was scheduled to have the surgery done at Sangre Grande Hospital. That arrangement fell through—no fewer than four times. Doctor absenteeism, lack of equipment and bed shortages led to successive postponements and drove the injured footballer to look elsewhere. Minutes after Wired868 carried his story, in which he admitted to “feeling like a total failure,” offers of assistance began to pour in. 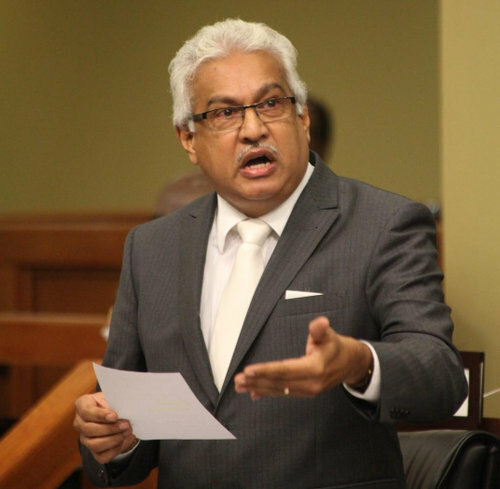 Health Minister Dr Terrence Deyalsingh learned of Rochford’s plight and, via his personal assistant Suzette Yhip, played a major role in ensuring that there would be no more postponements of the scheduled surgery. After the surgery, South West Regional Health Authority CEO Gail Miller-Meade confirmed that she was not aware of Rochford’s situation before his file reached her desk. However, she followed through as she would with any patient. “We have a process for purchasing implants and doing the surgery,” Miller-Meade told Wired868, “so he came in as a normal patient and once they had everything, it was a normal process. Another prompt response to the Wired868 story came from former T&T National Senior Team manager Bruce Aanensen, who reached out to enquired how best he could assist. “When I saw it published and they talked about 18 months ago he had this problem,” Aanensen said, “and he had been waiting to have this surgery done, I thought the thing was absolute craziness. Tapping into his network, Aanensen immediately contacted one of the premier orthopedic surgeons in the country and secured his agreement to perform the surgery pro bono. Having already confirmed a date for the procedure at SFGH, however, Rochford preferred to keep faith with that institution instead of exploring the private options. That faith paid off. Rochford acknowledged that, after 19 months of distress, he has indeed got a lot of support, for which he is really grateful. Many people but one goal. 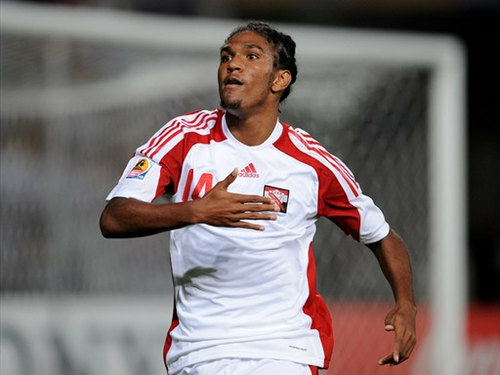 For now, the 27-year-old player, who has scored a goal for T&T in a Youth World Cup, is aiming merely to get back to 100% fitness so that he can once more take his place on a football field and begin to live again. 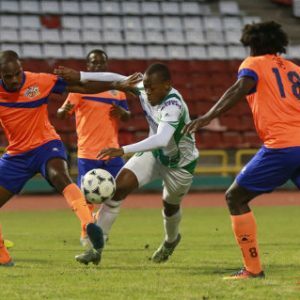 Photo: Police FC captain Todd Ryan (left) battles for possession with then San Juan Jabloteh mdifielder Jean-Luc Rochford during the 2013/14 Pro League season. Editor’s Note: This is the first in Wired868’s new monthly series, which aims to highlight social cases that merit national attention. Do you know of any such cases? Please send e-mail with as much detail as possible to Wired868 director Lou-Ann Sankar at louann@wired868.com. 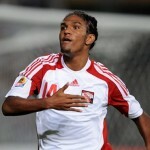 Great news a speedy recovery to u jean-luc and God’s continuous blessings. Where is The Football Association in this? What tree they hiding under? A Calypsonian sick or dying, no money to help from their Association. A World Cup player needs surgery, the Association disassociate its self from that. Then we get the usual cry, why Gov’t don’t help. People alyuh eh find that the Gov’t too much in we business n daily lives? There is something so wrong here! Why did he have to wait so long? Why didn’t the organisation responsible for him being where he was injured not so something? Also, if he had to wait so long and only get this because of the direct intervention of the MOH, what about John Public? Medical personnel are in that field because they want to make people get better – maybe not in TT though because there are too many stories of disregard and disrespect shown to members of the public who go to public health institutions. Something else that needs to change! Thank you God! It was too long man! There must be a plan from above Speedy recovery now! Great news. I wish him a complete recovery. Please take the required time with your rehab and you will be back on your feet again. Thanks for those phone calls Nicole Ulerie! ? Glad I could have assisted. Nice! I’m so happy for him. Good looking out Nicole? Nice nice! Kudos to all involved in making this happen. Now for rehab. I am happy for Jean-Luc. Wonderful news. I wish haim a speedy recovery. Sorry but that is criminal. 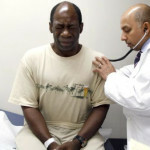 If the players can’t afford insurance, the least they should get is preferred treatment at the public hospitals. Fidel and Manning rolling in dey grave. So how we expect to attract foreign pro’s, thus enriching the standard of play here? Really sad that he will effectively spend two years out of the game at least during his prime years. Great news! All the best to Jean Luc! Happy for the good news and hope he can indeed get his career back on track. These players should have private insurance. Why in 2018 and in an era of “professional” football is this happening? At this time, after approaching most, if not all insurers in T&T, there is no policy available. Central FC arranged a bespoke cover with an insurer where they agreed to cover sports injuries for a season, but they decided not to renew. I think that cost $25,000. Another insurer covered medical costs as part of their sponsorship for 18 months. But there doesn’t appear to be a policy available to buy in T&T. So it’s not a case of clubs not being professional. I’m sure that the pro league would love to enlist an insurer as the official insurance company of the Pro League if they could provide a suitable policy. Kevin, it may just be that insurers do not wish to get involved with football administrators. The reputation of ALL may have been tarnished by a few. Very sad but insurance is about risk and return and the formula is often skewed by reputational risk. Bruce Aanensen that’s not the case. They view sport as high risk and the underwriters don’t want the exposure. When you look at the cost of surgery, rehab etc, a serious injury could cost them well over $50,000. So their premiums would have to be at least $100,000. More if you’re covering overseas trips. It’s an issue across Concacaf.